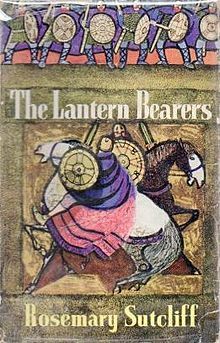 This novel of King Arthur from the Really Like This Books podcast scripts catch-up is Rosemary Sutcliff’s The Lantern-Bearers. It begins as one of her Romans in Britain novels, the books for which she is best known, a sequence that traces different periods of Roman rule in Britain, linked by the transmitted family heirloom of a glass ring engraved with a dolphin. In The Lantern-Bearers Aquila is a Roman centurion, visiting his family on their farm in what we now call Sussex, which has been in the family for generations. (Readers of earlier novels in the sequence will know who bought the farm, and who lived there before.) He’s one of the native British officers: after over 300 years of Roman occupation, the island of Britain has contributed generations of soldiers to the Roman army. He receives word unexpectedly that his legion is being pulled out of Britain, along with the rest of the army, and realises that if he goes, he may never see his family again. He goes back to barracks at Rutupiae, or Richborough, as it is now called, on the south-easternmost tip of England, and gets his men ready for boarding ship. But he doesn’t go with them. He becomes a wilful deserter, and allows the last ship to leave without him. As a farewell, he lights the great beacon at the fort to shine out while the Roman Empire leaves Britain for good. After that, he goes home. His father, blind but still a soldier at heart, is pleased but also not pleased; it isn’t so good to have a deserter in the family, even if it means deserting to protect one’s native country. The family settles down, but now that the Romans have gone, the Saxons come back, and one autumn night, the farm is attacked, and everyone is killed or taken as slaves. Aquila gets knocked out in the very violent struggle, but he sees enough to realise that while his father is dead, his sister Flavia has been captured. In a state of shock, he is taken to Jutland as a slave, and spends several winters there, learning the language and learning to be worth less than nothing. Sutcliff does a tremendous job of conveying the extreme psychological damage Aquila has suffered. Since he is shut off from his own language – Latin – and only able to speak Jutish, and because he is a brutalised slave under barbarian control, he loses his ability to be open, to remember freedom, and internalises his anger and hurt, destroying the boy he had been. The time comes for his owner to return to Britain for a great meeting of Saxon leaders, and Aquila is taken too. While he’s in the Saxon camp, he accidentally meets Flavia again: now the property of a Saxon warrior, and with a baby of her own. They are totally miserable at her continued captivity, because she will not leave her baby son, or her husband, even though she and Aquila regard slavery under the Saxons as the ultimate in degradation. She helps Aquila escape and he gives her the family dolphin ring. And so he gets away, more tormented than ever. Now we come to the Arthurian part. After a jump of several years, we meet Aquila again as the cavalry leader in the war band of Ambrosius, which the very young Arthur is just desperate to join. And now it all clicks into place. 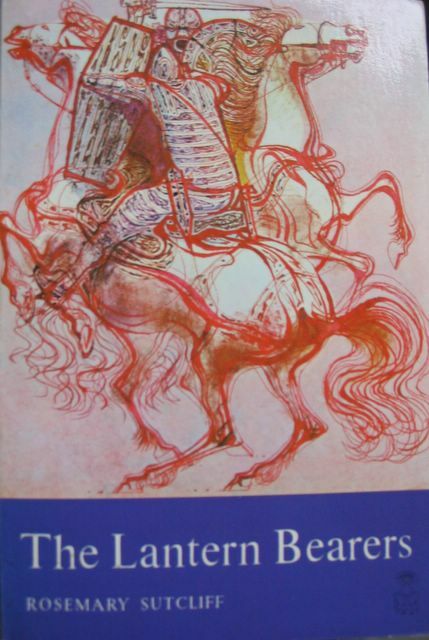 This is a retelling of the Arthur story which connects a what-if counterfactual speculation with historical post-Roman fact, and builds in all sorts of attractive ideas about the rebuilding of the defenders of Britain as a guerrilla force resisting the invading Saxons, year by year. It’s also a cultural argument, linking Roman civilisation, and advanced techniques in military strategy, tactics, discipline and techniques, with the heroism attached to the Arthurian legend. Not that Arthur is just another local-born amateur legionary, oh no. In The Lantern-Bearers he is a royal child, a golden boy and a natural horseman, a young man that everyone wants to follow because he is charisma personified. He’s also a nice person, honest and loyal and kind. This is fine when Aquila is his cavalry captain, because Aquila is content to serve under Arthur’s uncle, Ambrosius, because then he doesn’t have to think. He is still horribly traumatised by his years of slavery, and does not speak willingly to anyone. Ambrosius wants to build more alliances with the small kings in Wales and the west, and so he asks Aquila to take a wife from these provinces. Aquila is not at all interested in women, or marrying, but he does what his leader asks, goes to visit Cradoc in Wales, and almost at random asks him for his younger daughter Ness. The choice is bizarre, since he has hardly noticed Ness, and her elder sister is much more beautiful. But Ness was cross at Aquila’s arrogance and unfeeling contempt for their poverty, and somehow that stuck in Aquila’s mind. So Ness left her home to become Aquila’s wife, and a cold, miserable and lonely few years she had of it, since he paid her hardly any attention, and treated her calmly and coldly as a housekeeper rather than anyone he had a relationship with. But small things began to happen, and he began to miss her when she was not waiting in their cave or their hut with all things ready for his return. When he had, most unusually, to go and look for her in the woods, one autumn evening, he found out that not only had she been in love with someone else, but that man has just been killed in battle. What a mess Aquila has made of their lives. Ness has their baby, not long after, and so Aquila now had a son of his own, who he named Flavian, after his father, the first time he’d told Ness his father’s name. Flavian grows up, and Aquila struggles to become human again. His son is not a natural defier of authority, but he hero-worships Arthur, and through the story of the younger men we get the beginnings of the Round Table, and the rehabilitation of Aquila. The Lantern-Bearers is a harsh novel, because it’s about what war and captivity do to the psyche. It’s also about using authority wisely, and accepting when to fight a battle and when to leave things alone. Arthur is a good minor character, and we look eagerly for all the elements in his life and character that will turn into his legend much later. But the men of the story are the important ones, because this novel is also about resistance to invasion, a very British theme. Sutcliff did write another Arthur novel, called Sword at Sunset, but it’s nothing like as good as this one. This retelling of the Arthurian legend works best when she’s got her feet in Roman Britain, looking forward at the murky unlettered middle ages to come, when very little was recorded and a short life and a violent one was the norm for most people. When I was writing this podcast script, I was also reading a truly excellent, revisionist work of history, Robin Fleming’s Britain after Rome. This turns on its head the old idea that after the Roman Empire broke up and Britain was abandoned, there were waves and waves of invading Vikings and other fierce Norsemen from Scandinavia, flooding over Britain like a tide of blood. This apparently did not happen, and the archaeology proves it. What did happen were slow accretions of settlements in different areas for different reasons, which seems pretty much like common sense. Towns were abandoned and farms became the main settlement unit. Christianity disappeared, and then came back again. All of which makes sense when reading The Lantern-Bearers. Wonderful post! You laid out so clearly why it is both a children’s novel and a novel in its own right. I read The Eagle of the Ninth when I was about 10. 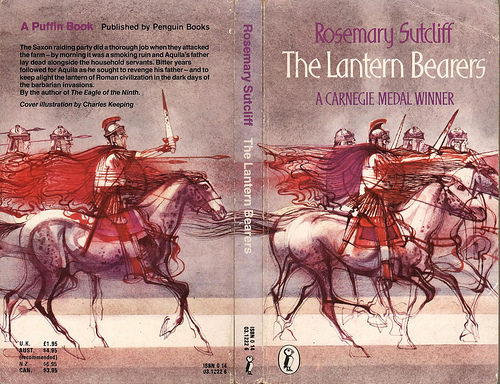 Oddly, enough I failed to read the next Rosemary Sutcliff novel (it may have been The Lantern Bearers) precisely because it was not The Eagle of Ninth. I read no more of her novels after that, simply rereading every few years or so The Eagle of the Ninth. I was in my thirties before I made a stab at her other novels. 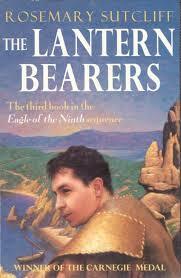 Like you, I think The Lantern Bearers is the best of an excellent bunch, primarily for its psychological depth. Thank you for reminding me why I need to reread it again, ideally with one of those wonderful paperback covers.